М-10 (or Е-105) road Moscow — St.-Petersburg to Valday — 388 km. Turn to the left at the crossroads under the sign «Valday Eco Club» on the way to Korotsko. Over the Korotsko village turn to the right under the sign «Valday Eco Club» and «Raduga» to the dirt road. Further on, in 1.5 km, to the right under the sign «Valday Eco Club». 1 option: «Moscow — Pskov» train to «Valday» station. It takes 6 hours and 50 minutes by train, then 10 minutes more of transfer to hotel (for more detailed information on trains check the website railwayticket.ru). 2 option: high-speed trains «Sapsan» and «the Neva express train» to «Bologoe» station. It takes 2 hours and 40 minutes, then 50 minutes more of a transfer to hotel (for more detailed information on trains check the website sapsan.su). It is a perfect option for a weekend getaway to Moscow region. М-10 (or Е-105) road St.-Petersburg — Moscow to Valday — 313 km. Turn to the right at the crossroads under the sign «Valday Eco Club» on the way to Korotsko. Over the Korotsko village turn to the right under the sign «Valday Eco Club» and «Raduga» to the dirt road. Further on, in 1.5 km, to the right under the sign «Valday Eco Club». From St.-Petersburg and Velikiy Novgorod by any train Moscow — St.-Petersburg to Uglovka or Bologoe station, then by bus or taxi. For Muscovites that find the arrival time to Valday by the Pskov train inconvenient, can also use this route. 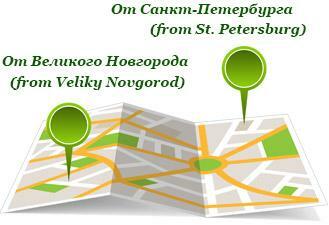 Take St.-Petersburg — Pskov road to Nikolaevo, then turn to the right to the road Nikolaevo — Shimsk (р52 road). Pass Shimsk and get to Velikiy Novgorod — Pskov road (a 116). Further go to V. Novgorod, pass it and move on St.-Petersburg — Moscow road towards Moscow. Valday will be on your left, and on the right there will be roadside hotel «Valday court yard» and the LukOil gas station. 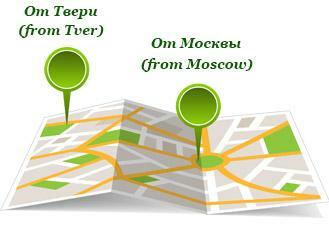 Between these two objects you turn to the right, pass Korotsko, and further move under signs «Valday Eco Club». «Pskov — Moscow» train to «Valday» station. It takes 6 hours and 20 minutes by train, then 10 minutes more of transfer to hotel (for more detailed information on trains check the website railwayticket.ru).